Little is known in the outside world about the conflict in Western New Guinea or West Papua, which became a part of Indonesia in 1962. There are nuances and complexities to what took place when Indonesia fought the Dutch for West Papua and about the vision that Indonesian independence leader President Sukarno wanted for West Papua and its people. Some may describe it as a fight against Dutch imperialism and colonialism by Indonesia gone wrong, even blaming the US for helping insulate corrupt regimes in Jakarta, whereas others would describe it as the outright occupation of West Papua by Indonesia. Whatever the case, like many of the other people in Indonesia, the West Papuan people are being discriminated against and are marginalized with the acquiescence of the US, Britain, Australia, New Zealand, Japan, the Association of Southeast Asian Nations (ASEAN), and other actors. The Indonesian military has targeted political dissidents, murdering them in different operations. There has been no justice for the victims of these domestic military operations in West Papua. The case of Arline Tabuni is one of these stories. Over three years ago Arline, who was a girl of the age of twelve at the time, was shot by the Indonesian military on July 1, 2013. Her story is just one of many tragedies in West Papua and in Indonesia. In the interest of introducing readers to the conflict in West Papua, so that they can make their own assessments, this article about the murder of Arline Tabuni that was written on 1 July 2013 is being republished by Asia-Pacific Research. Mahdi Darius Nazemroaya, Asia-Pacific Research Editor, 9 July 2016. Tabuni in the arms of a family member after being fatally shot by the Indonesian military through her neck and in her chest. Arlince Tabuni, a 12 year old Melanesian West Papuan girl, daughter of a pastor is enjoying life in her village highlands village of Popume. Suddenly, at 17:30, four fully armed Indonesian soldiers drive into the village with loaded guns. They briefly interrogate a member of her family and then demand he leaves the scene. They then proceed towards Arlince’s house. Seeing the soldiers, Arlince tries to run away. The military fire 3 shots, she is hit in the neck and chest and dies. In response to protests by the local community and outrage by Papuans across West Papua, the military at first denies the shooting and then claims they opened fire due to a sense of “excess frustration, and panic”. This sufficiently satisfies the Indonesian government who give full impunity to the soldiers who fired the shots. They hold no investigation and say nothing of the matter. But why were Indonesian soldiers in Melanesian West Papua in the first place? Why did they come armed into a peaceful highlands village? Why did they shoot a 12 year old girl? Why did the soldiers who fired the shots not receive any justice for their murder? And why did the international media not report about any of this? West Papua is the western half of the Melanesian island of New Guinea, in the Pacific Ocean, bordering the independent nation of Papua New Guinea (PNG). It lies just 200km north of Australia and the indigenous Melanesian people have lived there for over 40,000 years. West Papua was colonised by the Dutch in 1898 and always administered as “Dutch New Guinea” separate from their “Dutch East Indies” which is now Indonesia. With the promise of independence on 1st December 1970 and on 1st December 1961, the West Papuan national flag was raised with the beginnings of a democratically elected government formed, announcing a 9 year period of peaceful transition towards independence. But within months the dream was dead. The newly independent state of Indonesia wanted access to West Papua vast wealth and the military promptly invaded West Papua. Conflict broke out between the Netherlands, Indonesia and the indigenous population regarding control of the territory. Due to US fear that failing to appease Indonesia could result in the spread of South East Asian communism, the US government intervened and engineered an agreement between Indonesia and the Netherlands, which in 1962 gave control of West Papua to the United Nations and one year later transferred control to Indonesia. The Papuans were never consulted and after a sham referendum in 1969 with 1026 people handpicked Papuans being forced to vote for Indonesian sovereignty, West Papua officially became part of Indonesia. The West Papuan people never accepted Indonesia in their country and ever since 1963, have resisted Indonesian rule, first with bows and arrows and what little guns they could and then with peaceful civil resistance. The people of West Papua have regularly organise mass protests for self determination and independence and continue to appeal to the international community from speaking out through media to diplomatic pleas by exiled Papuans. Through a vast wealth of natural resources, like the largest goldmine on Earth (Grasberg), West Papua has become Indonesia’s largest GDP contributor, and with the prospect of an independent West Papua looking with international support, Indonesia does not want Papuans telling the outside world the truth. Not only has the Indonesian government banned all foreign journalists and human rights groups from West Papua but the Indonesian military and police also systematically target any West Papuans campaigning for independence and brands them as “separatists” and “terrorists”. Even the raising of the West Papuan national flag was made illegal by Indonesia and anyone raising it in West Papua can, if they are lucky expect 15 years in an Indonesian jail cell. Any unlucky West Papuans found supporting independence are simply killed. Indonesia sees Papuans as nothing more than inconvenient resistance in a land bursting with money to be made. The result of this brutal repression of any resistance is nothing short of genocide and it is estimated that over 500,000 innocent West Papuan men, women and children have already been killed by the Indonesian military since 1963. 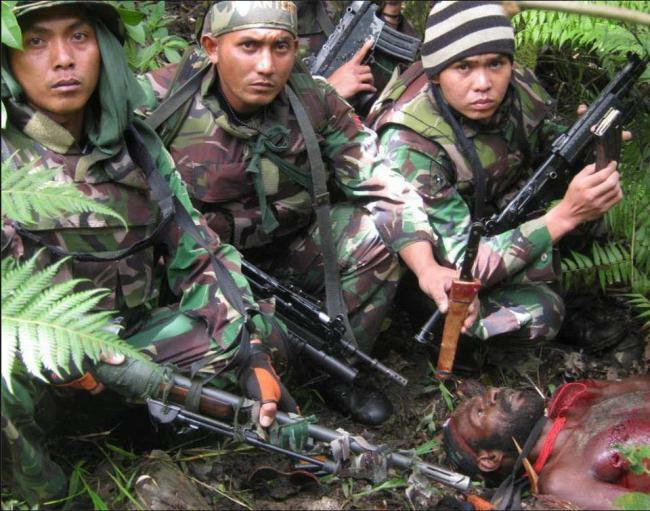 Indonesian soldiers pose for a “trophy kill” in 2013 to show off the corpse of Papuan farmer Wendiman Wonda whom they murdered. The Indonesian soldiers in Arlince’s village were conducting of of the military’s routine “sweeping operations” by which they section off whole districts away from the towns to sweep the area completely from any Papuans daring to speak out for self determination and independence. It is reported that some of her killers might have been from Indonesia’s “anti terror special forces” also known as Kopassus or “Detachment 88”. These troops are funded and supplied by the Australian government despite international calls to cease their support as they are responsible for some of the worst crimes against humanity in West Papua. According to reports the Indonesian military in Arlince’s village were looking for members of the outlawed Organisasi Papua Merdeka (OPM), a resistance movement founded in the 1970s which previously organised attacks on Indonesian military patrols. The Indonesian government is well aware that the OPM is nowadays a much more symbolic movement and that no villages such as Arlince’s are actually home to armed guerrillas. However, ever since the formation of the OPM, it has always been the Indonesian government’s excuse that any pro-independence Papuan that they kill or jail is a violent member of the “separatist” OPM. They use this excuse to bar all foreign journalists from entering West Papua. (Almost all Papuans now align themselves with peaceful pro-independence movements such as the West Papua National Comittee/KNPB). Arlince’s relative told them that there are none and that there is an Indonesian flag in the village (which is effectively mandatory in West Papua). The soldiers paid no attention to the man and marched directly towards Arlince’s house. They stood at the bottom of the garden and saw the 12 year old girl who ran. The Indonesian military saw Arlince. They saw her run away. This was no accident. There is no way the Indonesian military mistook a 12 year old girl in point blank range and directly in front of them for an armed and violent adult guerrilla fighter. It was yet another example of the extreme violence the Indonesian military uses to suppress and terrorise the indigenous people of West Papua. In rural areas such as Popume village in the Lanny Jaya Regency, the military is totally able to do as it pleases, using the highlands like a playground. However, it is the culture of impunity that is almost just as shocking as the murder. Imagine if the British military had shot a 12 year old Scottish girl because they were looking for potential family members supporting the Scottish independence movement? Even if the Indonesian military had shot dead a 12 year old girl in Java or Bali, this might make headline news around the world. As it is, this terrible incident happened in West Papua where no foreign media is allowed and even Indonesian journalists face the most widespread violence and suppression. A day after the shooting, at around 11:00, a joint police and military investigation team arrived and later so did Human Rights advocates. There was no agreement whatsoever between the girl’s family and the military. Though it would be no help for the loss of their daughter, the family at least demanded an immediate compensation of 1 billion Rupiah (about 86,000 dollars). There was mass outrage among the community and Malky Jigibalom, directress Tiom Hospital (Lanny Jaya), was furious. The Commission for Missing Persons and Victims of Violence (KontraS) also urged investigation into the murder Arlince Tabuni. “We deplore the violence still continues in Papua. Among them, we have the shooting information of a child, aged 12 years on behalf Arlince Tabuni.” said Yati Andriani, one of the staff KontraS, in a press release. “The actions above shows the lack of professionalism and brutality of the security forces in conducting security operations,” Yati said. A demonstration was also held in Lanny Jaya on 9th July, calling for all Indonesian soldiers to be pulled of of the Regency, the UN to immediately mediate in West Papua and for a full investigation into the brutal murder of Arlince Tabuni. To claim that the shooting was due to a sense of “excess frustration, and panic”. Indonesia ensures that the international community stays blind, deaf and dumb about the situation in West Papua. The family of Arlince Tabuni and the Papuan people are still deeply outraged almost a year on, not only from her murder but from the murder of every single of the 500,000 innocent West Papuan civilians who have been brutally murdered by Indonesia ever since 1963. The same soldiers who kill innocent people like Arlince are given medals by the government and praised. 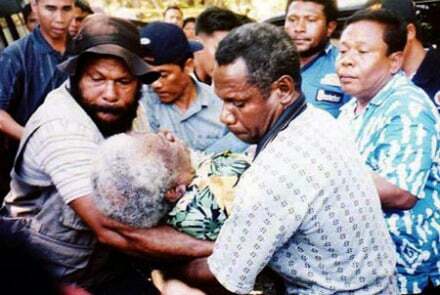 In 2001, West Papua’s greatest leader, Chief Theys Eluay who successfully led the Papuan people from strength to strength in gaining international recognition towards independence, was murdered by the Indonesian special forces. Friends of Theys pull his strangled body outside of the car where he was murdered. 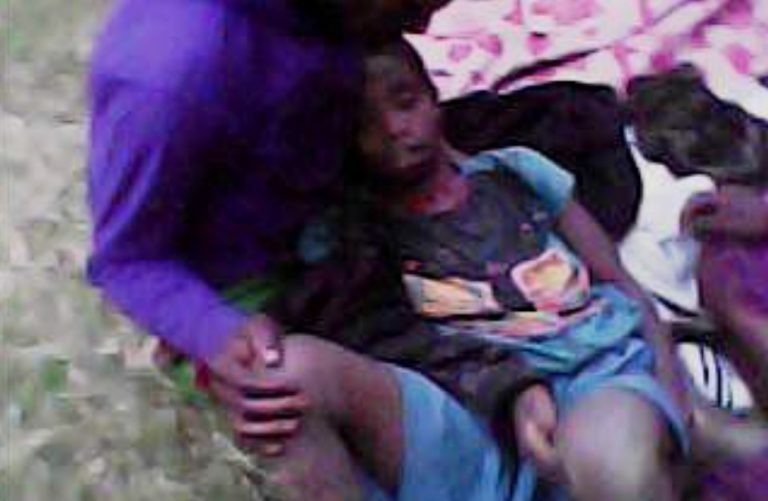 Jeny Badi, an 18 year old Papuan student who was gang raped by the Indonesian military and then shot dead in 2012. Immediately following her murder, the Free West Papua Campaign took action, writing to all media contacts and publishing this article, encouraging everyone to spread the word and take action to stop such incidents such as this happening again. This action has helped people all around the world learn about not just Arlince’s case but also that about the whole situation in West Papua and now finally, even international media such as the Telegraph has published the story. We would like to encourage everyone to also take action for the family and people of Arlince Tabuni. Please help to share this article and images throughout the internet and the world to let the world know what is really happening to the people of West Papua. Atrocities such as this will only stop happening when the outside world begins to see the horror and oppression that all West Papuans, including children have to face on a daily basis under Indonesian military rule. Please support the work of the Free West Papua Campaign. We are a voluntary organisation and every donation we receive is used to help free the people of West Papua. Visit the take action part of the website to find out how you can help more. Please keep the West Papuan people in your hearts, especially at this time of tragedy.